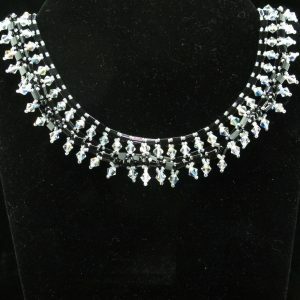 View cart “Swarovski Crystals Egyptian Collar” has been added to your cart. 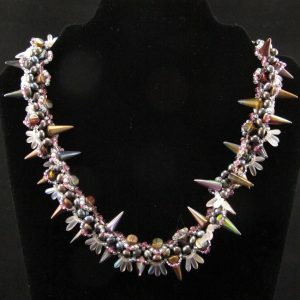 Made using real fresh water rice pearls, as well as spikes and daggers. 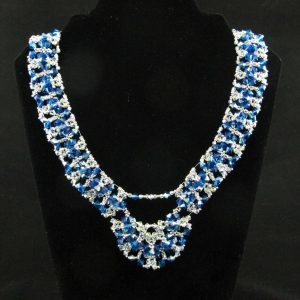 Has an overall bluish tone. Magnetic clasp. 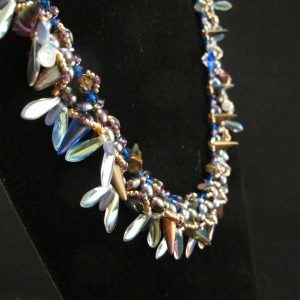 Made using glass rice pearls, as well as spikes and daggers. 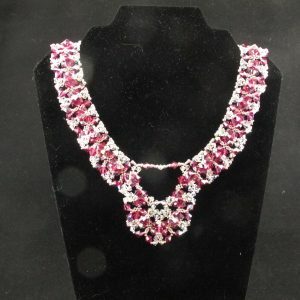 Has an overall pinkish tone. Magnetic clasp. 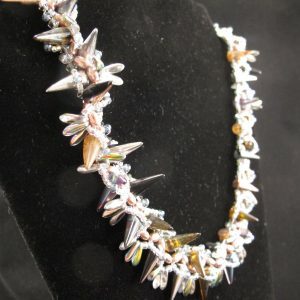 Silver lined crystal bugle beads and 4mm cat’s eye crystals make up this necklace. 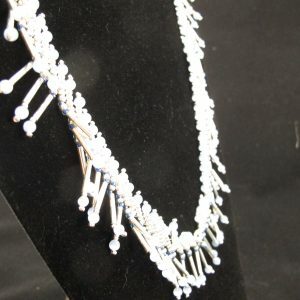 It measures 58cm (23in) including the clasp which is a fancy silver magnetic clasp. 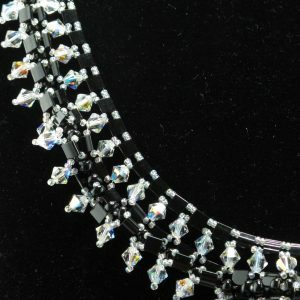 Over 200 Swarovski Crystals are in this collar – ranging from 6 mm to 4 mm. Clasp is gold plated magnetic. 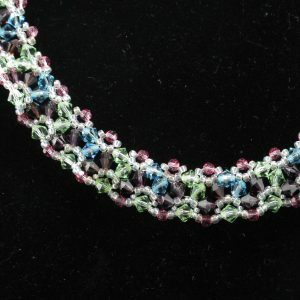 Pink, Blue, Purple & Light Green make up this Bejewelled Collar – lovely Spring/Summer Colours. 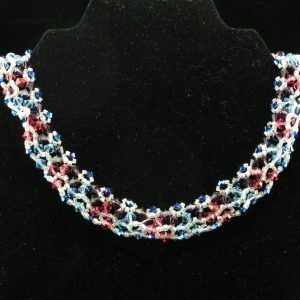 Light & Dark Blue, Pink & Purple make up this Bejewelled Collar. Has a Gold Magnetic Closure. 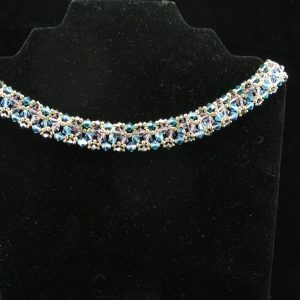 This Bejewelled Collar has Indicolite, Light Amethyst & Aquamarine as it’s Swarovski Crystals. Gold Magnetic Closure. 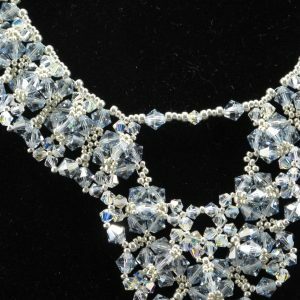 A Stunning Piece with two layers of Swarovski Crystals – the second layer forming the ‘drops’ of the Necklace. Magnetic Clasp. Very striking on. 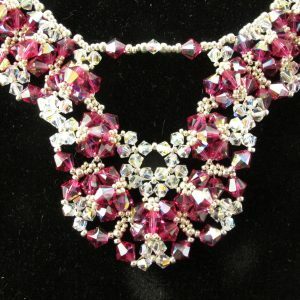 This item contains 410 Swarovski crystals! 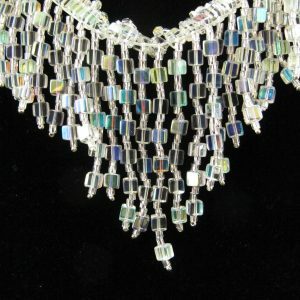 as well as countless seed beads. Photos can’t capture the beauty of this piece as it is too sparkly. 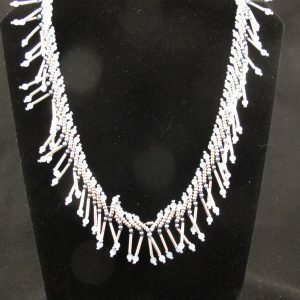 As the photos show this necklace cascades down the neck to a point. 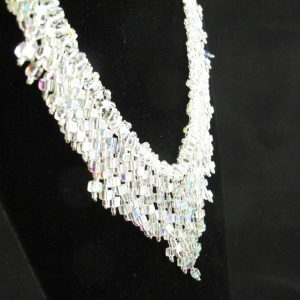 It is made out of crystal AB cubes and Swarovski crystals. 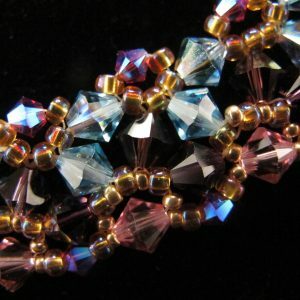 Clasp is a shiny, rhinestone magnetic clasp. 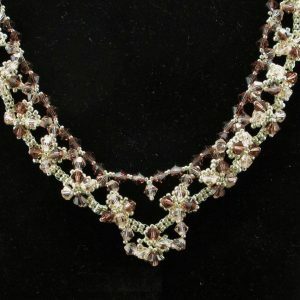 This Necklace is made up with a Framework of Silver Seed Beads and on top lie Czech Crystals in a light Pink and deep Whiskey Colour. 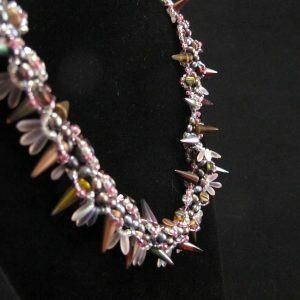 Made using glass pearls, spikes and daggers. Magnetic clasp. 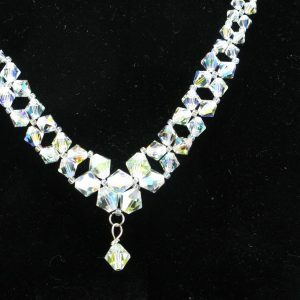 Made from 248 Swarovski 6mm bicone crystals and 190 Swarovski 4mm bicone crystals. It has a toggle clasp in Antique Gold. 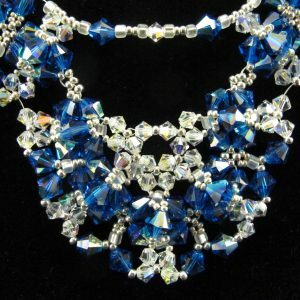 Over 400 Light Azore (Palest blue) Swarovski Crystals make up this intricate Necklace. It has a Magnetic Clasp. Priced to sell. 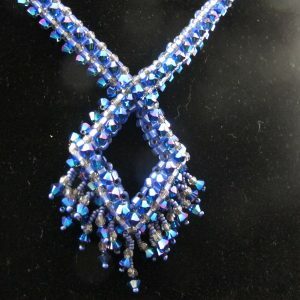 Made from 248 Swarovski 6mm bicone crystals and 190 Swarovski 4mm bicone crystals. It has a magnetic clasp. 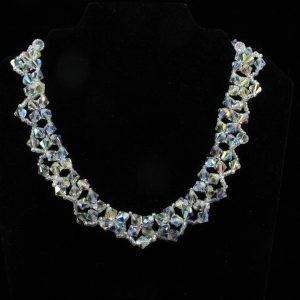 Made from 248 Swarovski 6mm bicone crystals and 190 Swarovski 4mm bicone crystals, in a Beautiful Subtle Colour. 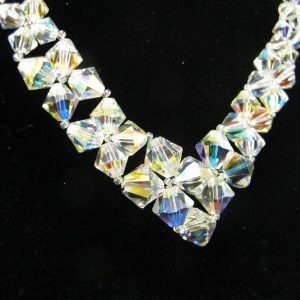 Swarovski ‘V’ Necklace with a drop at the tip! 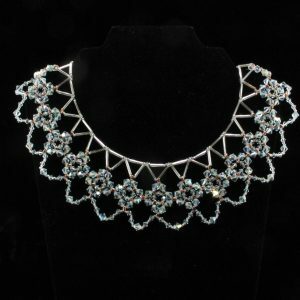 A simple, but elegant and eye-catching piece. 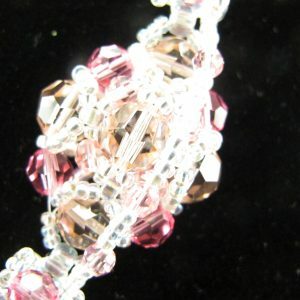 Contains 4 mm to 10 mm Swarovski crystals – a total of 138 crystals. 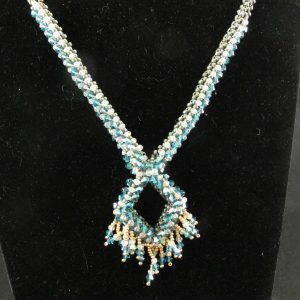 Has silver plated extender chain with parrot clasp. 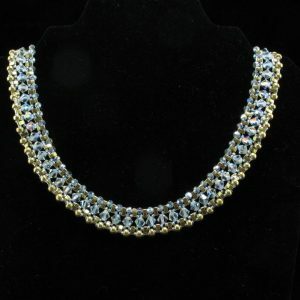 4mm Round and 6mm Bicone Swarovski Crystals as well as 24K Gold Plated Seed Beads make up this Simple but very Elegant Necklace. 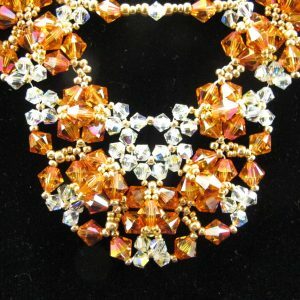 120 x 8mm Swarovski Crystals make up this Necklace. 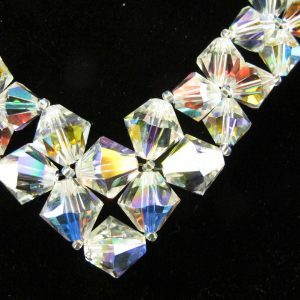 Each one is Crystal AB so the bling factor (like most of the necklaces is sky high!) Can’t be seen in any photograph. 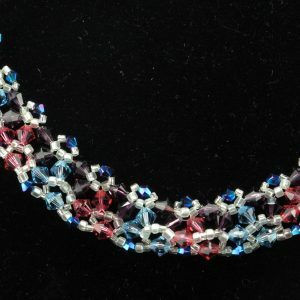 On a base of large quality (Miyuki) seed beads lie 140 4mm Swarovski crystals as well as 112 3mm Swarovski crystals. 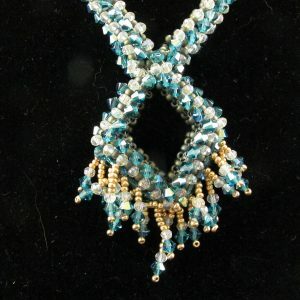 The clasp is a diamond shaped Toggle clasp. 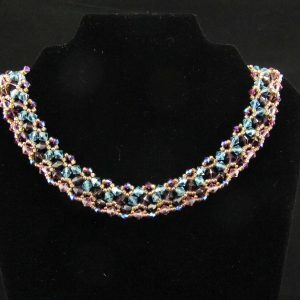 On a base of large quality seed beads (Miyuki) lie 140 4mm Swarovski crystals (in indicolite AB), as well as 112 3mm clear Swarovski crystals. The clasp is a triangular shaped toggle clasp in antique brass. 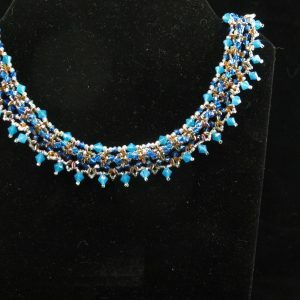 Caribbean Blue Swarovski Crystals and Gold Seed Beads make up this Collar which has an Extension Chain and Parrot Clasp. 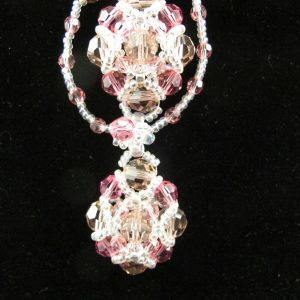 Each component in this necklace (there are 12) has a combination of 8mm, 6mm and 4mm Swarovski crystals. 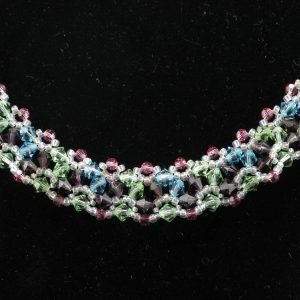 Fancy toggle clasp.